It is time for the labor movement to campaign for a “Right to Your Job” law. With anti-union Republicans in control of Washington, this might not seem like the best time to think and plan about workers’ rights. But to surrender to a mere survival mentality would be a mistake. We are on the verge of a major opportunity for labor renewal. 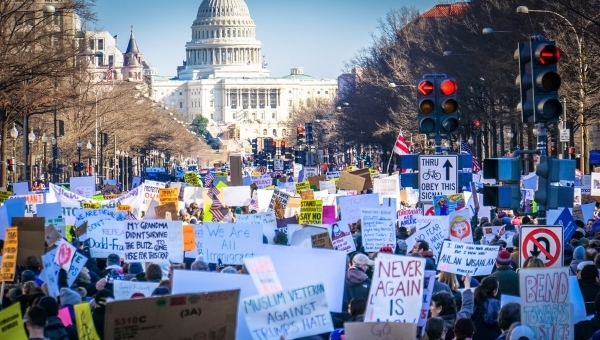 Among congressional Democrats, there is a growing recognition that a strong labor movement is vital to building a constituency for progressive change, and that delivering tangible wins for workers is vital to gaining and maintaining office. As one small example, the official labor bill that the Senate Democrats are currently offering is essentially a repeal of Taft-Hartley. This could be opposition theatrics, of course, but we believe something deeper is at play. A better example is a draft bill by Rep. Keith Ellison—as of this writing not yet introduced— which would amend the Fair Labor Standards Act of 1938 to make “just cause” the legal standard of employment and is at once a deeply radical and eminently sensible proposal. That it is a dead letter in a Republican-dominated Congress should not discourage us. Rather, we should press to keep it on the agenda and make it a battleground. Thus, legitimized by actual federal legislation, a campaign to win just cause as a “Right to Your Job” law in blue states and rebel cities would strongly contrast with and make the false term right to work ring hollow. There would also be a neat symmetry, as “Right to Your Job” is most winnable in non–“right to work” states. Explained simply, “just cause” is the principle that an employee can be fired only for a legitimate, serious, work-performance reason. “Just cause” empowers workers to have a voice. It gives them the power to say, “No.” “No” to requests that fall outside of a job description, to unwanted sexual advances or jokes, to an employer’s demand that the worker lobby the government on its behalf. It gives workers the right to engage in free speech out- side the workplace, to flip off the president, to attend a protest, and to engage in all manner of non-work-related speech, without risking their jobs. Just cause puts the onus on the employer to prove that a termination was for a valid work-performance-related reason and not—as a worker would have to prove today—that it was based on one of the few improper reasons contained in the law, such as racial discrimination, retaliation for blowing the whistle on inappropriate or unfair working conditions, or some public policy exception. That makes the campaign for just cause a natural complement to the #MeToo movement. Women are overrepresented in the service sector, where they may be subject to more demands that fall well outside their job description (if there even is a clear job description). Much of this comes in forms of emotional labor—where supervisors, customers, and clients alike expect female workers to fill roles analogous to surrogate moms, daughters, and wives. Furthermore, in every one of the most common occupations for women, they are paid less on average than their male counterparts. Women who request equitable pay increases know they are inviting undue scrutiny or new “duties as assigned” in retaliation. Women also experience sexual harassment in the workplace at alarming rates. A major 2016 Equal Employment Opportunity Commission report found that 25 to 85 percent of women experience sexual harassment in the workplace. The “Right to Your Job” law also makes sense as a defensive strategy for Black Lives Matter and Antifa (anti-Facist) organizers, who are currently vulnerable to targeted far-right attacks aimed at getting those organizers fired for their activism from the day jobs that are unrelated to their non-workplace endeavors. Because arbitrary termination is the boss’ greatest weapon, “just cause” can serve as the rule that protects all other rights at work. The labor movement must make common cause with these newly enlivened movements in the workplace. “Just cause” for all makes sense as a progressive coalition demand. This could be a winning issue in blue states with a political culture of ballot initiatives. We saw in 2016 that when paycheck issues and workers’ rights are put on the ballot, voters support those initiatives and often come out to vote for down-ballot Democrats in greater numbers. The alternative to “just cause” is the current mess of affairs euphemistically referred to as the “at-will” employment doctrine. “At will” is based on the false concept that because employees have the freedom to quit their job at any time, the employer should have the right to fire them at any time, for good cause, bad cause, or no cause. This formulation does not recognize that a worker’s right to quit stems from the Constitutional protections against involuntary servitude, while the employer’s right to fire does not stem from any fundamental right. Furthermore, “at-will” does not recognize the huge imbalance inherent in the employment relationship, where a worker who leaves his or her job rarely puts the entire enterprise at risk of failure, but an employer who fires a worker can cause that worker to lose his or her health insurance, home, and livelihood. Most workers who do not have an individual or collective contract find themselves as “at will” employees. Some may question whether workers will rally to win employment rights that many mistakenly believe they already have. To the extent that that is true, naming and blaming the “at will” doctrine must be taken up by the newly invigorated socialist left as a popular education project. In some ways, that would be a return to our roots. “At will” is entirely a judge-made law, and it has been unpopular with workers’ movements from the start. Early on in our nation’s history, judges imported the doctrine from English common law. This coincided with the Industrial Revolution breaking up the traditional relation- ship between master craftsmen and their journeymen and apprentices. It ensured that the new class of capitalists had no obligations to displaced workers. Most workers who do not have an individual or collective contract find themselves as “at will” employees. Earlier generations of the labor movement resisted the “at-will” doctrine and fought for employment rights for all workers. That changed with the advent of the National Labor Relations Act in 1935. Basing employment rights—along with retirement, health insurance, and pay standards—on the enterprise-level of contract bar- gaining was an accident of history, and one that places U.S. workers well outside the norms of employment standards around the globe. It worked—on its own terms—for a few decades. But it is increasingly clear that the system is breaking down under a sustained corporate assault and unions’ continued fidelity to the model of a bygone era that is part of the trap we find ourselves in. With “just cause” routinely negotiated into collective bargaining agreements, unions evolved to accept that job security is something a worker only gets for being in a union. Even today, many union leaders and organizers might have a slight preference for retaining “at-will” to drive more unrepresented workers to organize for a union contract at their place of work. Although that might have made sense in the 1950s, it is a completely counterproductive strategy in an era where union rights are under attack and employers routinely fire union activists to chill new organizing campaigns as well as subcontract and offshore jobs to avoid the reach of union contracts. The logic of this approach is also dangerous, as it could easily be used to argue against an increased minimum wage, universal health care, or a slew of other issues that would make all workers’ lives better. As a practical matter, “Right to Your Job” laws would open up new pathways to organizing. In a “just cause” legal environment, employers would have a self-interest in professionalizing their human resources department to avoid lawsuits and maintain discipline. Many companies would wisely institute forms of progressive discipline to document that underperforming employees were informed and counseled on areas of needed improvement before a “just” termination. Some might even institute an internal appeals process. A worker who receives a warning that his or her job is in peril might reasonably want to contest a write-up and seek help and representation. This provides unions with an opportunity for a new model of representation and membership growth. Unions could offer unrepresented workers an at- large membership for a reasonable fee. Unions could offer telephone or in-person counseling. If the “grievant” works at a company that the union is interested in organizing, providing onsite representation could be a good way to make inroads with other workers. More generally, providing such services would provide workers who have no experience with unions a positive view of them. The United Teachers of New Orleans (UTNO) re-established collective bargaining through such a strategy in 2014. Infamously, of course, the city fired all of its teachers in the wake of Hurricane Katrina in 2005 and methodically replaced most of the district with charter schools. But some schools retained forms of tenure in the rule books. The employers tended to evade it through a strategy of churning both the workforce and the “portfolio” of charter management organizations. However, at the historically elite high schools that were converted to charters, many of the former teachers were rehired and retained long enough to re-achieve tenure. When Benjamin Franklin High School moved to terminate a popular Latin teacher, UTNO represented him at a school board hearing and successfully saved his job. Before the school year was over, a rank- and-file organizing committee had signed up 90 percent of their colleagues for the union and successfully pressed the school board for voluntary union recognition. Contrast that with what happens these days when an unrepresented worker whose job is in peril calls most local unions for help. The worker is most often told “They’re allowed to do that” and “We can’t help you,” and the union usually writes off the shop as an organizing prospect, because how can you start a campaign with a worker who is about to get fired? The ability to contest a termination through mediation, arbitration, or lawsuits would also create a proliferation of worker/union-side labor lawyers. This is important because despite the common disdain for attorneys, especially those who advertise their services, the avail- ability and outreach by attorneys can serve an important educational function for workers who may not know their rights at work. Think of it as Better Call Saul, with more of a social justice focus. The increase of lawyers who rep- resent workers can also create a virtuous cycle, where there becomes an increase in judges who understand worker issues and thereby change the law to make it more worker-friendly. For decades, unions have watched in frustration as badly needed labor law reforms have died under Democratic administrations and Democratic congressional majorities. As a result, we have understandably tended to lower our legislative ambitions. To take advantage of this moment, unions, workers centers, alt-labor organizations, and workers’ rights advocates of various stripes need to take the opposite approach from what we did for the doomed Employee Free Choice Act (EFCA). 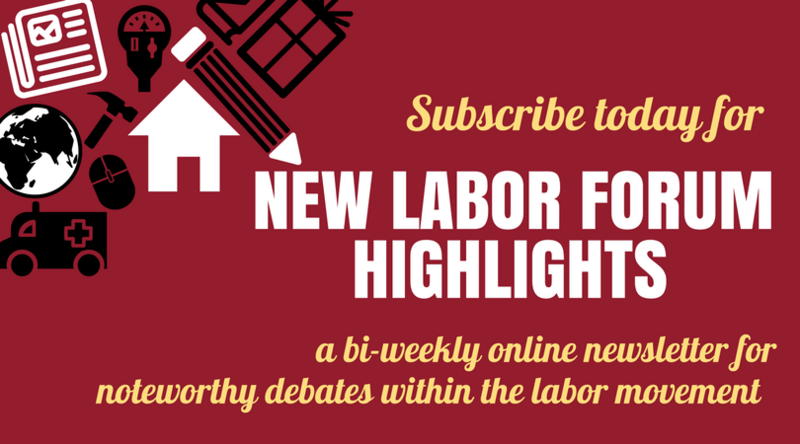 Rather than try to cobble together a consensus around a small tweak of the National Labor Relations Act (NLRA), we need to vastly expand our list of reform proposals and think way beyond the bounds of the NLRA. We need to promote legislative change that protects and empowers all workers to vindicate their rights on the job, to have a voice, and to form a union and collectively bargain. We have a rare opportunity to move big, bold ideas at the federal level. These can serve as trial balloons for what issues should be at stake in 2020 and beyond. They can also help spur and encourage state- and local-level campaigns to win them sooner. “Just cause” employment legislation should be high on the progressive community’s short- list of demands. We are in a unique moment. After decades of unions losing members and power, that regrettable trend is now widely recognized as a political crisis. Simultaneously, there is a resurgent left and a broad-based grassroots movement, and a Democratic Party hungry to reclaim it. It would be a mistake to tiptoe around the edges of labor law, only hoping that if we advocate modest reform, it might survive business opposition and Senate filibuster. The more minor and esoteric the reform, the more difficult it is to build broad- based coalitions to fight for it. A “just cause” employment campaign would not only serve the disparate goals of various workers’ rights groups, but it also carries the possibility of changing perceptions about employment and the employer. The more workers begin to experience and feel a right to their jobs, the more they can imagine what’s possible in the workplace. And, with the protections of “just cause,” the more workers can act on it without danger of losing their jobs. We do not propose this as a silver bullet to reverse labor’s sagging fortunes. Rather, we advocate the development of a bold and broad list of demands for workers’ rights. We would also suggest sectoral wage boards (see On the Contrary: “The Time Has Come for Sectoral Bargaining” in this issue), outlawing noncompete clauses (see Organized Money: “A Not-So Free Market in Bad Jobs” in this issue), and forced arbitration clauses, the criminalization of wage theft as some of the other items to be considered—along with a comprehensive repeal of the Taft-Hartley Act and modernization of the NLRA. But the demand for “Right to Your Job” is both overdue and timely. It is compelling and easily understandable, and contains within it the potential for widespread appeal. It is a demand that is worthy of unions who still consider labor to be a “movement. Moshe Marvit is a fellow at the Century Foundation specializing in labor and employment law and policy. Moshe Marvit, “‘A Better Deal’ Ensures Long- Overdue Worker Protections,” The Century Foundation, November 3, 2017, available at https://tcf.org/content/commentary/better-deal- ensures-long-overdue-worker-protections/. Josh Eidelson and Hassan Kanu, “The Newest Weapons against Unions Are Employees,” Bloomberg Politics, April 2, 2018, available at https://www.bloomberg.com/news/articles/2018-04-02/the-newest-weapons-against-unio ns-are-employees. “Most Common Occupations for Women,” U.S. Bureau of Labor Statistics, available at https://www.dol.gov/wb/stats/most_common_occupat ions_for_women.htm. “Report of the Co-Chairs of the EEOC Select Task Force on the Study of Harassment in the Workplace,” June, 2016, Equal Employment Opportunity Commission. https://www.eeoc.gov/eeoc/task_force/harassment/upload/report.pdf. Bill Fletcher Jr., and Shaun Richman, “What the Revival of Socialism in America Means for the Labor Movement,” In These Times, October 9, 2017, available at http://inthesetimes.com/ working/entry/20587/labor-movement-work- ers-socialism-united-states. Technically, it was more like a reduction in force. Teachers at the five and a half schools that remained in the Orleans Parish Schools district kept their jobs and their tenure. Everyone else had to “apply” for a “new” job in the Recovery School District or one of the private charter school companies it subcontracted to in the rest of the city’s schools. Moshe Marvit and Shaun Richman, “American Workers Need Better Job Protections,” The New York Times, December 28, 2017, available at https://www.nytimes.com/2017/12/28/opinion/ american-workers-job-protections.html.